The IEA’s Solar Heating and Cooling Programme will create its own international research platform on PVT systems in January 2018. Researchers and industry representatives from 13 countries so far will then start evaluating new PVT systems for HVAC solutions. This IEA SHC task, which is planned to run until the end of 2020, is being announced at a time when the PVT market in several European countries, such as France and Switzerland, is picking up speed (link to http://www.solarthermalworld.org/content/switzerland-rising-interest-pvt-technologies). Experts with an R&D or manufacturing background are welcome to join the platform (see the contact details at the end of this news article). “We see interest in new PVT solutions rising in several countries, as roof space is limited in urban areas,” said Jean-Christophe Hadorn, Manager of Swiss-based Hadorn Business Consulting, who will head the new research platform. “A new emerging technology such as this one needs all-round support from research and marketing.” The IEA SHC task will gather data about heating and cooling systems which include PVT and are in operation, provide methods to test PVT collectors, simulate the output of different PVT HVAC system configurations, try to find the right component combinations – for example, with or without heat pumps – and validate existing tools. Hadorn is pleased about the involvement of PVT manufacturers, which bring with them their recently gained experience of the market and new products. One of the platform’s founding members from the industrial sector is Dualsun, which mainly sells its equipment in France. “In France, a double solar incentive has made it possible for PVT to take off. A generous feed-in tariff for building-integrated PV (BIPV) was combined with tax credits for solar thermal applications, which had been substantial in the beginning,” said Laetitia Brottier, Head of Innovation at Dualsun. Additionally, utilising the heat from the backside of the BIPV units has a cooling effect on the modules. An October 2016 market study by French energy agency Ademe put PVT market volume at 62,220 m2 in 2015, based on an average 10 m2 (6 panels at 1.58 m2 per panel) per installation. In the same year, the solar thermal market amounted to 101,450 m2, according to Solar Heat Europe, the Brussels-based solar thermal industry association. “Historically, installers of residential PV systems used to be more confident working with air-powered PVT than with glycol. But an increasing number of plumbers are being trained to install PV, which is leading to more water-powered PVT systems,” said Brottier. Simply put, water is more efficient than air, and although air-powered PVT units dominate the single-family housing market in France, the trend towards PVT on multi-family and commercial property is being powered by water. Two examples of water-based PVT projects in the commercial sector are the swimming pool installations in Sète (see photo above) and Perpignan, both towns in the south of France, where Dualsun installed PVT systems. The solar heat of the two 300 m2 PVT fields is partly used for the showers and partly for keeping the pool temperature at 28 °C. With 119,870 kWh, the measured solar yield in Perpignan has been significantly above simulation results. In Sète, the measured yield has matched simulations (see the table below). Additionally, the specific annual heat yield in Perpignan, 399 kWh/m2, has been significantly higher than in Sète, which has shown only 274 kWh/m2. 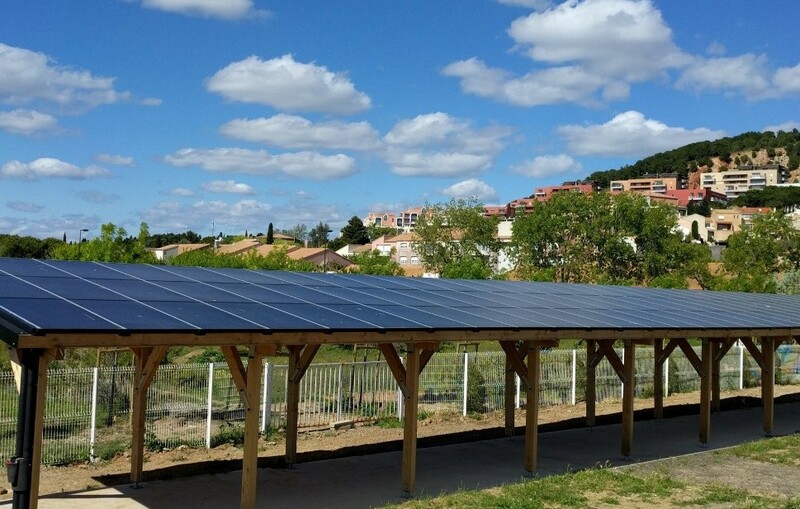 The difference can be explained by the less-than-ideal orientation of the panels in Sète (20° southeast versus south in Perpignan) and the greater-than-expected hot water consumption in Perpignan, which has resulted in a higher solar yield. The difference between simulation and monitoring on the electricity side can likely be attributed to an improved cell efficiency because of cooling, something which has not factored into the simulations. It is 5.6 % in Perpignan and 5.9 % in Sète. The kick-off meeting on the PVT research platform is scheduled for May 2018 in Freiburg, Germany. Four institutions from Europe and one from Qatar will take a lead role in project research and communication over the next three years: AEE INTEC, Austria, Fraunhofer ISE, Germany, Tecnalia, Spain, SPF Rapperswil, Switzerland, and Gord based in Qatar’s capital, Doha.